Your boots slip on the slick cobbles beneath your feet; the thick clouds of soot obscure the moon, making it difficult to see very far in the crowded alleyways. The image of the latest victim floats in your mind’s eye, unshakeable. You know that your fellow officers are on the nearby streets, somewhere- it’s only a matter of time until this monster is caught. Looking up, you catch a glimpse of a shadow disappearing around a corner. Hurrying to follow it, you get to where it disappeared only to find a few drops of blood on the grimy pavement- a clue! You blow your whistle, signaling your fellow officers, the net begins to tighten. 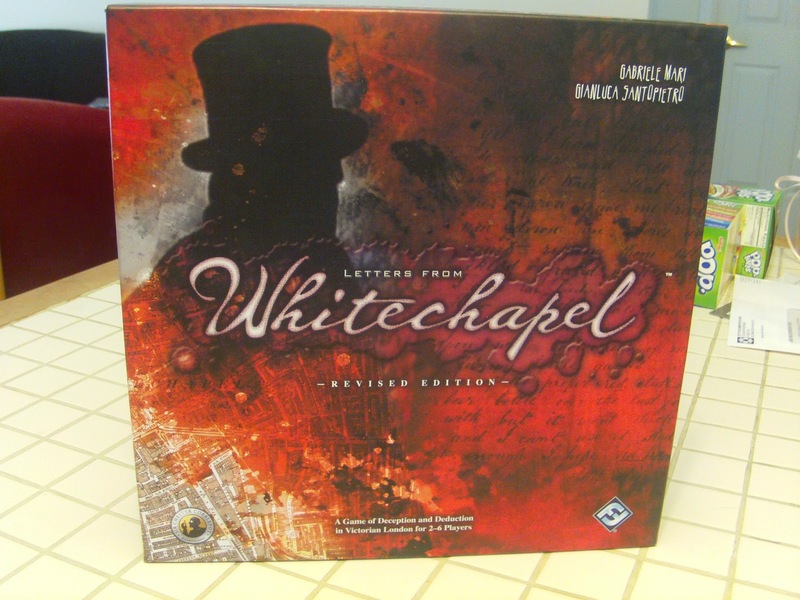 Letters from Whitechapel is a strategic game of deduction from Fantasy Flight Games and designed by Gabriele Mari and Gianluca Santopietro. It plays 2-6 players and games can last anywhere from one hour to several. In this game, one player will assume the role of the notorious serial killer, Jack the Ripper. Over the course of four nights, he will kill five prostitutes on the streets of Victorian London. If he can do so and each night return to his secret hideout with being apprehended, he wins. If either he is arrested, or unable to get to his hideout by the end of each night, the police officers win. Yes, this game is essentially a macabre version of cops and robbers. But it’s also so much more than that. You see, the board for this game is a highly detailed map of Victorian London. Jack moves along from one numbered circle to another and the police officers move from one little black square to another (every path goes: number, square, number, square). However, while the police have their pawns on the board, Jack does not. He instead makes notations on a pad of paper, writing down each number that he moves to. After each player have moved each round, the police can either search for clues (check each number directly attached to their square to see if Jack has been there at all, so far that night) or make an arrest (declare a single number attached to them- if Jack is currently on that number, they have caught him and won the game.) Those are the only things each player can do. Police officers can move, then check for clues or make an arrest and Jack just moves. Well, that isn’t entirely true- each night Jack has a certain amount of Coach and Alleyway tokens he can employ- coaches allow him to move two spaces in one round (and more importantly, he can ride in a coach right past a police officer) and alley tokens allow him to cut through the normally solid city block to a number on the other side. But still- all Jack does is move around on the board. Suffice it to say, there are not a lot of rules for each player to remember. No, Reginald, I don’t care that you think he’s over there, he has to be over here. Look, you make sure your constable is over hereso he can cover these streets while I send mine over to this intersection. If we do that, he has to go through here… unless his hideout is over here… oh bugger. You could actually be right, Reginald. This is a game that makes up for its lack of rules with extreme, nail-biting tension, especially if you are playing as Jack. You’ll watch your opponents debate and argue, pointing along different alleyways, deciding how to best coordinate their efforts. Meanwhile, you are sitting a mere intersection away from where an officer is. Every second, every delayed moment until the next turn, every single argument back and forth makes you sweat lead and clench until you’re sure that if you stood up, your chair would be coming with you. And you do all of this at the same table and (I think, more importantly) while trying not to give anything away. When the officers start debating on whether they should start looking for clues in a direction completely opposite of where you are going, you’ll want to cheer. But you can’t. However- a word to the wise. The more players you add, the longer the playtime extends by a considerable amount. No matter how many players, there are always five officers chasing down Jack- so if you play with less than six players, someone will be controlling more than one officer (which actually makes efforts at coordination much easier.) But the more players you have, the more ideas there will be, leading to more discussion, more debate and more people agonizing over their turn. We found that four total players seemed to work best for us, but try it for yourself, experiment to find what works best for you. Will you be able to make your kills and slip away into the night? What’s more, all of these moments make an incredible story- one that you can all share once the game is over. You’ll look over Jack’s sheet of moves and start discussing it, looking at how each night played out. How you came so bloody close, yet we just out of reach. Or how you finally outsmarted him, working together to close off avenues of escape until you finally nicked him, together- as a team. Letters from Whitechapelis one of the best kind of games- the kind that creates an experience and memories with friends- memories that you’ll want to share with other friends so they can enjoy this game too. A Space Ahead heartily recommends Letters from Whitechapel, dear readers, and urges you to go out, get it and get your hands dirty on the gritty streets of London. Want to try out your skills of deduction? If you live in the Bloomington area, you can find this game at The Game Preserve. If not, check it out at your local game store. Support local game stores!